Our new symptom diary is free to order! A patient’s chance of survival significantly increases when they are diagnosed early, that’s why it is so important to monitor symptoms in order to notice any irregularities. When should I use the symptom diary? 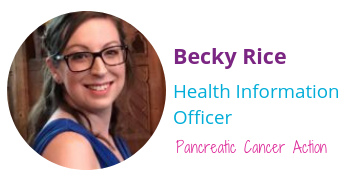 If you think have any of the signs or symptoms of pancreatic cancer, it is important that that you track them. Symptom tracking, involves recording what symptoms you have, how severe they are and whether or not any treatment works. It is important to keep a detailed record for over two weeks in order to notice any re-occurring symptoms. This allows both you and your medical team to monitor any new or ongoing symptoms until the cause is found and they are resolved. 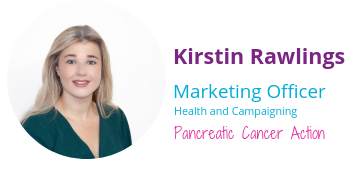 Pancreatic cancer can cause a number of symptoms, some key symptoms are: jaundice, unexplained weight loss, upper abdominal pain, mid-back pain and indigestion. The symptoms and severity can vary for each person. It is important to remember these symptoms can be caused by many different conditions, including irritable bowel syndrome or indigestion. We encourage patients to note down all symptoms, whether they are linked to pancreatic cancer or not. Tracking your symptoms means your GP can monitor them, follow up on your appointments and refer you for diagnostic tests or a specialist appointment as soon as possible, this may help lead to an earlier diagnosis. Our symptom dairy is available to download or order for free, this resource also provides useful information on the disease. We have made the symptom diary into an A5 booklet which makes it easier to carry around. How do I get the symptom diary? The symptom diary is available for both healthcare professionals to order for their practise as well as patients who would like to keep track of any symptoms that may be of concern. The symptom diary also includes further information and medical advice on what to look for. If you or someone you know, could benefit from ordering this symptom diary please click here. Alternatively, you can download the symptom diary as a PDF below. If you would like to find out more about our healthcare resources, click here. Previous Article Spinach, chickpea and sweet potato curry Next Article NHS Long Term Plan - what next?